The Solemnity of the Most Sacred Heart of Jesus is May 30. Here is a fairly simple idea for an appetizer which could be served on this date or during the month of June which is dedicated to the Sacred Heart of Jesus. Use a heart shaped mold to form cream cheese into heart shape, or shape by hand, or use knife to cut it into a heart shape. Pour salsa or taco sauce over heart to cover. Break pretzel sticks into smaller pieces and insert into cream cheese across middle to form a "crown of thorns." Place grated cheese coming off top of heart (or around heart) like flames. Serve with crackers on the side. The heart is the spread to put on the crackers. I really wanted to get some of these heart-shaped crackers. I emailed the company and got some possible leads on local places that might carry them but didn't end up finding any locally. I could have ordered directly from the company but didn't need the case amount or justify the cost for shipping. A similar heart could be made to coincide with recognition of the Immaculate Heart (month - August). For the Immaculate Heart you could cover with salsa/taco sauce or leave the cream cheese heart white for purity. Put a line of small silk flowers (or edible ones) across the front. Pierce the side with a plastic cocktail sword. There is so much inspiration here at Catholic Cuisine! Mary's Bread - A Staple of Liturgical Year Celebrations and then Mary Ellen's Feeling Wine-y, a practical guide to experimenting and enjoying wines, got me all excited -- these ladies share my enthusiasm! I had sketched an outline for an article years ago on some how-to pointers celebrating with bread and wine for the Liturgical Year (on the back of two envelopes, no less -- my greatest brain storms are always sketched on the backs of envelopes). After being inspired by Mary and Mary Ellen, I thought this might be a good time to flesh it out! While some of these ideas can be incorporated in the family, you might also say this series could be entitled "Feasting for Adults through the Liturgical Year." Like Mary Machado mentioned, "Bread is such a significant image in our faith...and it is a staple of life." I find breaking bread (literally and figuratively) and sharing wine together is such a wonderful social experience. I enjoy baking bread, although I've had to shelve most of my interaction with wheat flour because of my older son's food allergy to wheat. There might be a chance he'll outgrow the allergy, but for now I enjoy talking recipes and eating other people's masterpieces. This is the most obvious: bake breads that are traditionally linked with a feast or saint, such as the German Christmas Christollen or Stollen which resembles the Christ Child in swaddling clothes. Or St. Catherine’s Wigs for St. Catherine of Alexandria’s feast on November 25. Don't be limited by yeast breads, but remember there are a vast array of recipes for sourdough breads, rolls, quick breads, muffins, gluten-free and wheat free baking, scones, (American) biscuits, etc. In our family dinners I mark the special feasts with some kind of bread, as I don't serve it every day. Use bread recipes from a geographic area, region, or culture. For example, for the feast of St. Francis of Assisi, Italian bread would be appropriate, but you could also delve deeper and use a bread recipe from the Umbrian region or specifically a recipe from the city of Assisi. The same principle applied elsewhere, such as not confusing Spanish with Castilian saints (St. Ignatius of Loyola was Castilian). France is divided into various regions, each with unique flavors, such as bread from Provençal. Our Holy Father, Benedict XVI is from Germany, but he's specifically from Bavaria. Use regional ingredients (grains, fruits, etc.) to mark a feast. Is a saint from Scotland? Oat cakes or scones or bannocks would be a perfect touch. For example, serve the native corn in the style of cornbread on Saint Kateri Tekakwitha's feast on July 14. For St. Barnabas the Apostle (June 11), incorporate some olive bread, since one of his symbols is the olive branch. Or mix in some appropriate vegetables, fruits, and/or nuts into your usual bread dough to mark the feast. Use inspiration from other traditions and customs around the world. 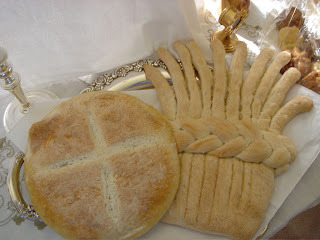 The food doesn't have to be applied to the original feast, like Symbolic Breads, which were originally from St. Joseph's feast day, but the shaping of breads can be applied to various feasts, including this upcoming Corpus Christi Sunday. Also look at historical recipes, like biblical, Ancient Mediterranean, medieval, etc. Try medieval baking for a saint or feast from the medieval era, or biblical breads, such as Ezekiel fasting bread for ember days and unleavened bread for some New Testament saints. And how about some Jewish kosher cooking for saints like Martha? A Jewish challah bread would be perfect for her day! Play with words! Sometimes recipes have unique or fun titles, or use proper names. If a bread has a name that fits with the saint of the day, use it! I keep thinking of the story of panettone, Tony's Bread by Tomie dePaola. Since it's named after Tony, it would be perfect to serve on St. Anthony Abbott's feast on January 17th, whose daily bread was brought to him by a raven. Most Italians don't bake this bread but buy it, so purchase an extra box at Christmas and save it for this feast. Be inspired by the shapes and colors of breads. A fabulous Easter bread is the Italian Colomba di Pasqua or Colomba Pasquale (Easter Dove). My husband and I have bought this for two Easters from our favorite local Italian restaurant. Although it's originally an Easter bread, the dove shape makes it perfect to serve Columba Pasquale for Pentecost or Confirmation celebrations. And the same can be applied to Greek Trinity bread -- an Easter bread, but triangular in shape would make it perfect for the Feast of the Blessed Trinity (yesterday's feast). Cloverleaf and Shamrock Rolls can be used for the feast of St. Patrick and the feast of the Blessed Trinity. Have a blessing of bread when everyone is gathered before eating. The older form of the Roman Ritual has a delightful collection of blessings of foods, particularly breads. Lord Jesus Christ, You live and are King forever. Bread of angels, Bread of everlasting life, be so kind as to bless this bread as You blessed the five loaves in the desert, that all who taste of it may through it receive health of body and soul. R. Amen. This page has a compilation of the Blessings of Food. Note there are three specifically for bread! 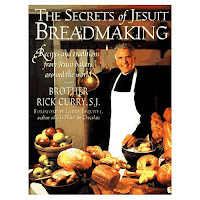 The Secrets of Jesuit Breadmaking by Brother Rick Curry. For me there are two types of cookbooks, one is wonderful reading AND good recipes, and the other a great compilation of recipes. This falls into the former. Brother Rick shares the spiritual side of baking bread. He follows St. Ignatius' rule to make a daily Examen of Conscience, and does it while he bakes bread. "Radical or not, I consider it to be one of the secrets of Jesuit breadmaking." This is a delightful cookbook, with such personal anecdotes and practical baking advice. He uses recipes from Jesuits from all over the world, with breads for all the seasons: Advent, Lent, Christmas, Easter, and also daily breads, rolls, muffins and corn breads. The Festive Bread Book by Kathy Cutler. This is an out-of-print cookbook, but very easy to find used copies. It has the most delightful collection of festive breads for all sorts of days, both secular holidays (Lincoln and Washington's birthdays, Election Day, for examples) and some religious feast days, including ones like St. Barbara (December 4), St. Lucia, and St. Joseph. Not every recipe is illustrated, but the book does include several mouth-watering photographs. Celebration Breads: Recipes, Tales, and Traditions by Betsy Oppenneer is an excellent, step-by-step cookbook for baking bread. Each recipe has alternative directions for mixing by hand, by mixer and by food processor. The book is organized by country and then breads for various celebrations of that culture, with descriptions and tales for each. It's a delightful book, with hand drawn illustrations throughout. Check out a preview at Google Books. May 22 is the optional memorial of St. Rita of Cascia. In the last months of her life, when she was very ill, Rita received a visit from a relative. When they were saying goodbye, the relative asked if Rita wanted anything from her home. Rita replied that she would have liked a rose and two figs from the garden. It was the middle of winter and this seemed an impossible request. When she arrived home, the relative was surprised to find, on a rose bush bare of leaves and covered with snow, a magnificent rose, as well as two figs on the fig tree. She picked the rose and the fruit and brought them to the St. Rita. St. Rita is often pictured with roses and she is the patron of impossible causes. As a special addition on the day of this memorial, enjoy a simple tea or snack time featuring roses and figs. On the menu you could include Fig Newtons (or make your own fig bars - see recipe below) and rose scented tea. We just picked up some China rose petal tea from a local specialty tea shop. It smells heavenly. Another drink alternative for non-tea drinkers would be a pink lemonade with a touch of rose water. Fig filling: Chop 1 package (12 ounce) moist dried figs. In small saucepan mix with 1/4 cup sugar, 3/4 cup water and 2 tbsp. lemon juice. Cook over medium heat, stirring until thick and jam-like. Remove from heat and cool. -Beat together butter, sugar, eggs and vanilla until well blended. -Mix flour, salt and baking soda. Stir into first mixture (dough will be stiff). Wrap in plastic wrap and chill for at least 3 hours. -When ready to bake, turn dough out on lightly floured surface. Roll into a 14 by 12 inch rectangle. Cut into 4 strips 3 1/2 by 12 inches long. -Spoon filling evenly down center of strips. With spatula, turn in sides of strips. Press edges together to seal. Cut each strip into 10 pieces. Arrange seam side down on baking sheets. -Bake at 375 degrees for 10-12 minutes or until firm and lightly browned. Potato and Cheese Filling: Cook the onion in butter until tender. Combine it with potatoes and cheese. Vary the proportions and ingredients in this recipe to suit your taste. Mix the flour with the salt in a deep bowl. Add the egg, oil and water to make a medium soft dough. Knead on a floured board until the dough is smooth. Caution: Too much kneading will toughen the dough. Divide the dough into 2 parts. Cover and let stand for at least 10 minutes. The filling should be thick enough to hold its shape. Roll the dough quite thin on a floured board. Cut rounds with a large biscuit cutter, or the open end of a glass. Put the round in the palm of your hand. Place a spoonful of filling in it, fold over to form a half circle and press the edges together with the fingers. The edges should be free of filling. Be sure the edges are sealed well to prevent the filling from running out. Place the pierogi on a floured board or tea towel and then cover with another tea towel to prevent them from drying out. COOKING: Drop a few pierogies into a large quantity of rapidly boiling salted water. Do not attempt to cook too many at a time. Stir VERY gently with a wooden spoon to separate them and to prevent them from sticking to the bottom of the pot. Continue boiling for 3-4 minutes. The cooling period will depend upon the size you made it, the thickness of the dough and the filling. Pierogies will be ready when they are puffed. Remove them with a perforated spoon or skimmer to a colander and drain thoroughly. Place in a deep dish, sprinkle generously with melted butter to prevent them from sticking. Cover and keep them hot until all are cooked. Serve in a large dish without piling or crowding them. Top with melted butter- chopped crisp bacon and/or chopped onions lightly browned in butter. REHEATING: One of the great things about pierogies, is that they can be made in large quantities, refrigerated, frozen and reheated without lost of quality. Many prefer reheated pierogies as compared to freshly boiled ones. To re-heat, you can: 1) pan fry pierogies in butter or bacon fat until they are light in color or, 2) heat the pierogies in the top of a double boiler or in the oven until they are hot and plump or, 3) deep fry them. Another great recipe which would make a nice lunch or light supper. Don't let the long ingredient list put you off, you probably have most of them in your pantry. Parboil cabbage in a large pot, removing leafs as they fall off into the water and are tender. Cook till all leaves are tender, but not ripping apart; usually 15. Run under cold water and drain. Cut the thick membrane off back of each leaf. While cabbage is cooking saute onion in butter until lightly browned. Put all the uncooked meat into a large mixing bowl add eggs. Next add salt pepper, celery salt, parsley, nutmeg, and Worcestershire sauce along with the cooked rice. Mix it all up thoroughly. Lay out leaves and depending upon their size, place 2-3 tablespoons of meat mixture on the wider side. Roll leaf up and over meat, tuck in sides of leaf, and continue to roll to use all leaves and stuffing. Place rolls, seam down into a greased roasting pan. Layer carrots and mushrooms over cabbage. Mix together the tomato paste, crushed tomatoes, water and brown sugar and pour evenly over all the rolls. Season with salt and pepper to taste and add bay leaves. Cover roaster and bake 325 degrees for 2- 2&1/2 hours. Half way through baking check to make sure there's enough liquid; additional water can be added. To serve, spoon sauce over rolls. Serve with Mashed potatoes! I leave you with my favorite Pope John Paul II quote. "Have no fear of moving into the unknown. Simply step out fearlessly knowing that I am with you, therefore no harm can befall you; all is very, very well. Do this in complete faith and confidence." I love being Catholic. We have such a rich heritage of tradition with regard to celebrating our faith. It always saddens me when I hear of other Christian denominations diminishing celebrations by coming down on our tendency, as Catholics, to enjoy our wine. It is so sad to exclude this part of a celebration in the name of some perceived idea that we are not to fully enjoy ourselves. Catholics love a good party and if you doubt my word go find yourself an Irish priest and ask him. We love our food and our wine. We are also big fans of beer. The fact is that even St. Thomas Aquinas thought we should enjoy ourselves with a glass of wine on occasion. Loosely translated this means wine can be lawfully drunk to the point of cheerfulness. Doesn’t that sound great? Cheerfulness. Now no one is advocating you get fall down drunk every Friday night but to enjoy the fruits of the vine in a happy way. Happy that God gave us the gift of these resources to make this elixir which when imbibed responsibly transports us to a heavenly happiness. Can you tell I enjoy the hooch? Before I became a mother I worked for a prominent investment bank in marketing. This meant that I helped bankers with the presentations they made to clients, institutional investors, and in doing so I was able to do quite a bit of event planning. I would help them with editing presentations, rehearsing their speeches, arranging for the proper A/V equipment and, on occasion, I would be responsible for planning an entire weekend event. Toward this end it was necessary that I know something about formal dining and that included being sent to many wine tastings (rough job, I know) and a few classes to learn how to pick wines for a dinner. I was also privileged to work with a few sommaliers who were more than willing to educate me. This was all a long time ago but once you’ve kept 300 bankers and their wives entertained and informed for three days at a resort planning a First Holy Communion or graduation party does seem much easier to accomplish. One thing several people impressed upon me was that it is not necessary to buy very expensive wines but to buy the right wines for your family and friends. The wine that compliments the food correctly will help a meal really sing. I encourage you to visit your local wine shop (or liquor store) and ask for help. Attend wine tastings when you can and if you live in an area that has a vineyard, for heaven’s sake go visit it. Long Island is wine country and we are fortunate to be able to spend a “date” day every year or so touring one or two vineyards and sampling some of their production. Buying a flight of wine (a sampling of four or five wines) is an inexpensive way to learn what you like. Often there are restaurants right there in the vineyards where you can try your favorites with some food. When you are planning to serve wine there are some very basic rules of thumb that help you pair things up. In general light foods are best suited to light wines and more robust and heavy foods are better suited to a more robust wine. It is generally acknowledges that there are six key food flavors; salty, sharp, savory, spicy, smoky and sweet. Salty foods go better dry white wines. A Chablis is a good choice. Sharp flavors are best paired with a wine that has a higher level of acidity like a Sauvignon Blanc or a Riesling. Spicy dishes need a more fruity wine. Spicier food will reduce the sweetness of the wine so you need something quite fruity to stand up to that. Try a rose’ but please, as a favor to me, avoid the white or blush Zinfandels. They are the nerdy cousin of wine and should only be served in case of Armaggedon when nothing else is available. Try a Spanish Rosado. Smoky needs a strong flavor to stand up to the different flavors. Try a Shiraz, there are some wonderful inexpensive ones from Australia. They are my personal favorite. Sweet food will make a wine seem dry. Try to pair your desserts with a wine or sherry that is sweeter than the confection you are serving. Port or Madeira is popular. I encourage you to broaden your horizions the next time you have the opportunity to try a new wine. It is very easy to get stuck in a wine rut. Even if you really only like Chardonnay or Merlot try a wine from a different region than one you are used to. Merlot grapes grown in Chile, for example, have a much bolder flavor than those grown here in the United States on the west coast. And those differ from the ones grown here on the east end of Long Island. I would also recommend trying blended wines. My current favorite is Yellow Tail’s Cabernet Sauvignon/Merlot from Australia. It is a rich, heavy wine with a slightly plumy taste. I love it. If you take nothing else from this remember that wine should be fun and not scary. It should not create stress for an hostess but rather should commemorate an occasion, highlight your food and be toasted to your hospitality. Thank you for joining us as we share the bounty of ideas in this, Catholic Cuisine's first From Thy Bounty Fair. Today's fair focuses on the celebration following the ultimate celebration of reception of the Eucharist for the first time. Whether it is large or small, at home or in a restaurant, so many families choose to celebrate and "feast" together as they joyfully celebrate this special day - creating memories for the First Communicant. As I contemplated this fair I was thinking of First Communions of the past, my own and those of my children who have already received. This is a very special sacrament, one that they will be able to receive over and over in their life time, but that first time is very memorable, following the anticipation of waiting. This is a big day, one that is full of memories and we can help them make memories through our celebrations. Eileen at I Lean on Him, shares her memories and recalls with fondness cakes that graced their family's table on First Communion Sundays of the past. You'll get a look at a wonderful cake personalized by the First Communicant. I love this idea - it is a memorable addition in so many ways. Eileen also shares the words to the homily from her daughter's First Communion last year - definitely spiritual food for thought. Tracy at Pinewood Castle knows how busy the First Communion Day can be, so she shares a simple and festive idea for an easy 1st Communion breakfast that morning. It's so creative and symbolic, yet easy to pull off. No matter what else you have planned for the day this is a very memorable addition. Christine of Memories of a Catholic Wife and Mother, shares her memories of last year's First Communion for Bernadette. The cakes that they get for their children on their First Communion say, "Welcome Jesus! ", continuing the theme of the novena that they say prior to their First Communion day. Since she had a 4-month-old baby at the time, she says she kept the cake very simple by using boxed cake mix, store-bought icing and candy flowers, and a sticker from CHC's "Old Master's Stickers". The important thing was that it met her daughter's specifications and she liked it. Whenever you waltz over to Matilda's you always know you'll be treated to a beautiful and well crafted celebration. Waltzing Matilda gives us a peek at the day and the the party they had last year for Sunshine's First Communion. It is complete with lovely cake and some special requests on the menu from the First Communicant. I'm sure a day she will long remember. This past Saturday was the big day for this First Communicant. At Burning the Candle at Both Ends, Chris tells us about Thomas' big First Communion party, a tradition for their family. I was drooling over the menu which included his special request - a chocolate fountain. Every little detail adds so much to this amazing celebration. Lots of fun ideas here. Jessica at Shower of Roses has a very fitting post offering the reflections of St. Therese on her First Communion. A beautiful remembrance story. Then in her detailed post, Preparing for First Holy Communion, Jessica shares both the spiritual and practical preparations they have been making for her oldest son's First Communion later this month. These include the plans for a special cake with ideas from A Continual Feast. Meredith of Sweetness and Light, shares her son's First Communion Notebook. Not only is the notebook a wonderful activity for the preparation of the reception of this most Holy Sacrament, it can also be a place to record the memories and celebrations of the First Communion day. Matthias' notebook includes his description of the people who shared the day with him and how they celebrated by eating lunch together. The celebrations don't always take place on the same day as the First Communion. When you visit the Island in the Grove, Donna will let you see a glimpse of an outdoor first communion celebration that extended the festivities to a full weekend for Christian. The cross shaped cake (which he helped to bake) is quite impressive, especially with the addition of live flowers. What a great combination for celebration, floral cakes and catching frogs & newts! Suzanne celebrated a first of many Gladdest Hours' First Communions earlier this spring. A beautiful and memorable day it was with Madeleine looking lovely in an family heirloom veil. Considering the soon to arrive new bundle, the family and friends opted for going out to lunch enjoying the cake at the church's reception after Mass. Jenn of Family in Feast and Feria once again has compiled some great suggestions from a vast array of liturgical year and feast day celebration resources. There are so many ways that one can incorporate symbols of the Eucharist into the festivities and meals. One post focuses on breads -beautiful photos and ideas here. And of course desserts are a vital part of celebratory parties with cakes often playing an especially prominent part as a centerpiece of the party. Some festive cakes are shown and linked here. And finally Christy shares an appetizer which fits the theme of including bread in First COmmunion celebrations. It sounds delicious. Place brie and cream cheese in bowl and microwave until soft. Saute garlic and onion in olive oil until onion is transparent. Add pepper to taste. Cut circle in top of round bread and scoop out to make a bowl--save top. Beat together cheeses and garlic/onion mixture. Scoop into bread bowl, put top on, wrap in tin foil and bake at 350* until heated through (approx. 20min.) Serve hot on sliced baguette (Christy gets the cook and serve ones in the bakery at Fred's and serves them warm). We hope you have enjoyed the fair! Continuing the idea of incorporating some symbols and symbolic foods in the First Holy Communion celebration, I am sharing some symbolic dessert ideas. The main attraction is usually a cake. First Communion Cakes can be very fancy, as I found a beautiful example here and Domestic-Church's suggestions. With the words "Happy (or Blessed) First Communion (or Confirmation)," plus the child's name. With a short quotation from Scripture, such as "Blessed are the pure in heart; they shall see God" or another of the Beatitudes (Matthew 5), or from Psalms, perhaps. With the image of a dove, often a symbol for the soul. With an image of a chalice and a paten (the flat dish holding the sacred Host). With the image of a standing person praying with arms outstretched (from early Christian art). With an early Christian image of two angels carrying a "sacred monogram" that is, the letters chi and rho (X and p), which are the first two letters of the Greek word for Christ. My favorite idea was from my sister-in-law. She used two round cakes. The first she decorated to look like the host, and the second round was cut up for the chalice shape. The stem from the middle of the 2nd round piece and blended the pieces together with the shallow piece as the stand and the deeper piece as the cup. The somewhat crude illustration shows how to cut, then frost in the appropriate colors. Peanut Butter frosting makes a perfect color the chalice. There will be some crumbing to do because of the cut-up cake, but it makes 1quite an impression on the children. Cover a larger piece of plywood with aluminum foil or some other covering to place both cakes together. Our family loves to use this most delicious Carrot Cake recipe from Tiger Bait: Selected Recipes from LSU Alums for our celebrations. I can easily adapt the following for the above design, or just keep the round cake as the reminder. Preheat oven to 350 degrees F., grease and flour two 9" round cake pans or one 13x9x2" baking dish (round cakes taste better than the pan with this recipe). In mixer, combine cream cheese, eggs and oil and beat well. Add remaining ingredients for cake and mix. Pour batter into already prepared (greased and floured) 9" round cake pans or 1-13x9x2 baking dish. Bake round pans for 45 minutes and 55 minutes for baking dish. Cool completely before frosting. Icing: Cream butter and cream cheese together until very light and fluffy. Add granulated sugar gradually, mixing in between. Add milk and vanilla and beat until smooth. This makes enough to ice middle, top and sides of two 9" round cakes. Optional: Add chopped nuts along sides of cake. Incorporate white foods for the main meal or dessert, to remind of the purity of soul, the beauty of grace, the white Communion host. Want to do more than a cake? Bake some sugar or butter cookies. Roll dough into a ball, squish into circle with a bottom of a glass, then sprinkle and bake. Decorate using a stencil to sprinkle colored sugar in IHS or other symbol on the cookies, or just use icing. A round cheesecake (even store-bought -- Trader Joes has fabulous frozen ones), surrounded by grapes would be a beautiful visual of the host of the Eucharist and the grapes used to make the wine. Perhaps using icing to decorate some symbols on top of the cheesecake will make it a very easy but visual dessert! Make a round Kugelhopf or bundt cake, insert the baptismal candle or Christ Candle in the middle. My sons haven't made their First Holy Communion yet, but many of my numerous nephews and nieces have. Each celebration has been unique, but after the Mass it always involves family, food, and dessert. Since receiving Jesus in the Eucharist is the climax and pinnacle of this day, the rest of the celebration should never overshadow the main event. So in thinking of ways to celebrate this occasion, I keep thinking that simplicity and familiar and favorite foods are the main course, with just a few highlights or symbols sprinkled throughout. As mentioned in this post, I like highlighting the accidents of the Eucharist, bread and wine, to remind us of the Eucharist throughout our celebration. And since the Feast of Corpus Christi (or Most Holy Body and Blood of Christ) is two Sundays away, some of these ideas can be double duty! So many traditional customs from around the world draw in bread symbolism in their celebrations. One example is the traditional Polish Oplatek, which is a wafer, similar to what is used for the Eucharistic host, broken and shared at the Christmas Eve meal in Polish families. This custom comes from the old papal custom eulogia, which consisted of loaves of bread blessed by the pope and distributed (or here). The act of sharing the one Oplatek reminds us of the Mass. While this isn't Christmas, sharing one loaf or wafer with everyone would provide beautiful symbolism. Incorporating wafer type foods in our meals is also another extension of the First Communion. See Wafer making and , or Ostia Italian Wafers. Pizelles or Italian Wafers are another type of "wafer" cookie and making them could be a wonderful family activity (or buy them already made). I like mine without anise, if you please. Decorative breads, or symbolic pastries, as inspired by the Sicilian custom of a St. Joseph Altar made for St. Joseph's Day would be perfect as decorations for your First Communion party. There are numerous shapes to make, but here is an example of Sheaf of Wheat bread or Vegan Sheaf of Wheat. My sister made some of her own edible decorative breads out of her favorite French bread recipe, and followed the directions for the sheaf out of My Little House Crafts Book by Carolyn Strom Collins. Place water and yeast in large mixing bowl. Allow yeast to dissolve. Stir in 2 cups of flour and salt. Dough will be very sticky. Gradually stir in more flour until dough is workable by hand. Turn out onto floured surface and knead, adding more flour as necessary, until dough is smooth and springy. (This takes about ten minutes.) Return to bowl, cover with damp dishtowel, and let rise until doubled in bulk. Punch dough down. Let rise a second time until doubled. Punch dough down. On floured surface, form dough into two long loaves and place in French bread pan. Or divide dough into three sections; shape each section into a long cylinder; braid; place braid as loaf or wreath on baking sheet. Cover and let rise until doubled. Slash tops of loaves (not braids) with sharp knife or razor, about 1/2-inch deep. Bake at 400 degrees 20-30 minutes, or until golden. (You may place a few ice cubes at the bottom of oven -- the steam makes the outside of the loaves crispy.) Suitable for freezing. Makes 2 loves. Nota Bene: Do not skimp on the rising! The longer rising times enhance the flavor. The dough may be formed into rolls, wreaths, braids, baguettes, pretzels -- experiment! Another St. Joseph Altar custom is the symbolic pastries, which are not edible. Symbolic pastries are vital to an altar as they represent the objects that are sacred and holy in the life o the Holy Family or the church. Examples – Spata (or spada, Monstrance – the pastry centered on the altar which holds the host), heart, basket, fish, staff, chalice, cross, palm, among other symbols. These so easily tie into First Holy Communion, or save this idea for the feast of Corpus Christi, which will be next Sunday. 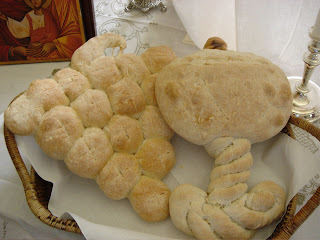 Some examples of symbolic pastries and recipes can be found at ItaliansRUs, ThankEvann or Catholic Culture. The one below incorporates the fig filling, which gives the background contrast. Make a well in the middle of the flour. Pour melted warm Crisco and water into the well. Mix until firm dough is formed. Knead dough until firm. Roll out as thin as possible – large enough to cut out desired shape. Cut out the desired shape with a sharp knife. Place this layer in the baking pan. Dried fig is placed on dough in the shape of the symbol being made. Fill figs high for sturdiness. Cut another shape from the dough to place over the figs and bottom layer of dough. With real care and artistic skill, cut out leaves, vines, flowers, etc. through the top layer to expose figs. The top layer is similar to a piece of “cut work.” Bake at 375 degrees for 20 minutes. Then up to 425 degrees for 4-5 minutes. Anna Mae confides that she places a stick through the back of her pastries for firmness and to keep them from breaking. And you might enjoy reading some thoughts from my favorite Liturgical Cookbook author, Florence Berger. These are selections from her cookbook, Cooking for Christ, printed in 1949. They aren't directly related to First Holy Communion, but continue the thoughts on how bread brings our thoughts back to the Mass. Blessed Imelda (d. 1333), whose feast is celebrated as a memorial on May 13, is the patroness of First Communicants. From the tender age of 5, she longed to receive Jesus in the Eucharist, but was repeatedly denied due to her age (at the time, children were not allowed to receive their First Communion until age 12 or 14). So intense was her longing that Our Lord finally came to her Himself as she prayed following Mass, in the form of a Sacred Host hovering over her head. The priest, who witnessed the miracle, took hold of the Host and offered it to 11 year old Imelda. Upon receiving, Imelda went into spiritual ecstasy before immediately joining her Lord in Heaven. Her miraculous First Communion paved the way for eventually lowering the age at which children are allowed to receive Jesus in the Eucharist. I find it touching and special that the patroness for First Communicants – most of whom are little children themselves – should be one so young! How often our little ones hear the word “No,” as did little Imelda – especially when it comes to their desire to help out in the kitchen. In honor of this young saint and the children for whom she intercedes, then, I thought it might be appropriate to write a bit about the joys of including little ones in the making of our daily bread. But I find that my children and I have the best experience of all when I try to match their kitchen activities to their developmental level – meaning, I try to look at what they already love to do and are good at, with an eye to the skills needed to complete a given recipe from start to finish. A few notes on logistics. If the children are already happily engaged in other activities, it’s easy to quietly draw one of them away for “their part” of the set-up – prepping – mixing/forming – cooking/baking – cleanup sequence. My 8 year old is great at set up, my 4 year old loves simple prepping, they all love mixing, the 8 year old loves being allowed to help out at the stove, and my 2 and 4 year olds will splash in soapy water with the measuring cups, bowls and spoons all day if I let them, while the rest of us clean up the mess. I keep my hiking backpack handy in case the 2 or 4 year old needs to be held, while my hands remain free – say, if the 2 year old is on the fussy and tired side. My little ones can be quick to “fall apart” at times, and there’s no better way to calm them than to pick them up and carry them around – but if you’re in the middle of a cooking activity, that’s not always practical or even safe. All children enjoy having special jobs in the kitchen; the trick is to set up the activity so that each one has a special job that they are particularly good at, and can pursue with some degree of independence or happy cooperation with each other. But you need to be fully present to them throughout the activity. This can’t be stressed enough. Even if you set aside the dangers inherent in any cooking activity – and there are many – the presence of lots of tempting, messy and normally off-limits tools and ingredients can lead very quickly to chaos. So turn off the phone, forget the dishes and laundry, hearken back to a time before frequent e-mail checking was the rule, and stop multi-tasking for a little while. Make the world go away, as the song says, and set aside an hour or so to “take chances, make mistakes and get messy” in the kitchen with your kids! Recognition of the gifts we have received from the Lord's bounty is first and foremost in any celebration. A celebration of a child's First Holy Communion is no exception. Consider this beautiful prayer from Let's Say Grace: Mealtime Prayers for Family Occasions Throughout the Year by Robert M. Hamma (OOP) to begin your feasting and festivities. and gave him/her the gift of life in our family. and called him/her to live as Your son/daughter. Your Son Jesus in the Eucharist. so as to grow in friendship with You. and help us recognize Christ in one another. We ask this in Jesus' name. When planning the foods and decorations for the celebration, symbols associated with the Eucharist are commonly used. -The usual symbol for the Holy Eucharist is a chalice, with a host rising out of it, with either IHS or INRI imprinted on the host. -An altar, upon which is set a cross, two or more candles in their tall candlesticks, a chalice and a ciborium, is another symbol often seen. Using the symbols is beneficial to remind us of the accidents of the Eucharist, the bread and wine, including the shape and/or color. These symbols could be used in decorations or incorporated into the food choices and how they are decorated. Another idea for decorations is to use the child's baptismal garment and candle. -Round Crackers and cheese, with grapes in platter. But remember symbolic foods doesn't necessarily have to reign the day. Many people celebrate, using favorite foods of the First Communicant or foods to please the crowd, or going out to eat. May 13 is the Optional Memorial of Our Lady of Fatima, the anniversary of the first apparition of Our Lady to Lucia, Jacinta, and Francisco at Fatima, Portugal in 1917. Portuguese food would be a nice addition to a meal. My husband's family is Portuguese and Carne Vinho de Alhos (meaning meat in wine and garlic) is a favorite of theirs. It is meat, commonly pork, marinated in a spicy garlic vinegar marinade and is quite delicious. This is his grandmother's recipe. We use country style pork spare ribs but lean pork chops can be used. 1 part red wine vinegar to 2 parts water is the liquid base. For 2 1/2 pounds of meat we have used 1 cup vinegar & 2 cups water. Add spices to vinegar/water mixture. Mix liquid and add meat. The meat in the marinade should ideally set in the refrigerator for 2 days before cooking to soak up seasonings according to my in-laws. This is optimal but could be marinated shorter time. Bake at 375 degrees until cooked through - time will vary by quantity. Pour off drippings and grease at least once during cooking. The finished meat should be without liquid, but not dry. For larger quantities of meat increase water, vinegar, and spices. Today, May 10 is the optional memorial of St. Damien (formerly Joseph de Veuster) who was a missionary to Hawaii. He dedicated his life in service to the lepers of Molokai. He served among them for 16 years before succumbing to the disease himself in 1889. I know it's short notice, but maybe a mini-luau or some Hawaiian dishes would be in order for dinner. Probably to late to procure the pig for roasting but there are other tasty suggestions for Hawaiian fare at these sites. Thank you for the enthusiasm you have shown for Catholic Cuisine. We will be hosting our first fair next week and your participation would be very welcome and much appreciated! We thank the Lord for the blessings He has provided to our families and the opportunities those give us to celebrate and feast "from thy bounty" in our domestic churches through the year with all the feast days and celebrations. The From Thy Bounty Fairs will be a place for all of us to share our bounty of celebrations and feasts with each other in the format of a blog fair. Since Spring (April/May) is a common time for First Holy Communions we are focusing this first fair on the festivities and foods of this sacrament's celebration. There will be various First Communion related posts at Catholic Cuisine over the next week. Then the Fair will be May 15. If you would like to participate please send me - mary_machado at comcast dot net - your submissions of First Communion Foods/Feast/Celebrations by the end of day May 14th or leave the link in the comments section. Even if you don't have a blog we would love your ideas and/or pictures to add to the fair. How does your family celebrate at home? Do you have a party? What foods are served? Does the first communicant pick the menu? Do you go out to eat to celebrate? Are there cultural traditions in your family?